I've missed this thread this whole time. Very cool stuff. When you ask for a commission at a con, do you pay right on the spot? I've never been to one before. It depends on the artist. Larry Hama has a list and you leave the character you want as well as your name and phone number. He does not accept money until you have your commission which is EXTREMELY generous and if you follow him on facebook, sometimes results in pieces that he draws and are not picked up. He auctions off commissions that are not picked up. Today I shot over to the Javits immediately after work and am far down the list for possible commissions. I am hoping to pick mine up on Saturday but will probably get it on Sunday. On top of that... I have a line on another page. I am keeping my fingers crossed that something can be worked out. I held off on the other page. I may pick it up in the spring as the dealer wants a very strong price for it considering what it is. I am definitely interested but have other things to pick up. Here is the sketch I commissioned from Larry Hama. I asked for and received Tunnel Rat. Picked up a new page today. Issue 20 Page 29 featuring Clutch in a half page splash rocketing away from doom. This one will go on the wall. My GI Joe page hunting recently took a break after picking up other comic art including a Spider-man page I really liked among some other things. Last edited by Buzzetta; 10-07-2018 at 08:42 AM..
Forgot to post some acquisitions tee hee. So I forgot to post these from last year. I commissioned two pieces from Larry Hama at NYCC 2017. This year it is not looking so good since I am pretty far down on the list as I got there a little late. 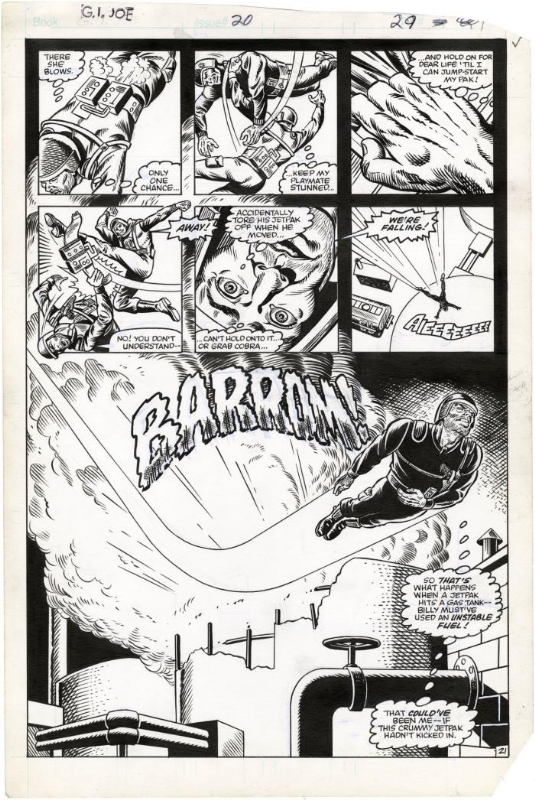 GI Joe Issue 30 Page 2. This was when Zartan and the Dreadnoks infiltrated McGwire Air Force base as the Joes were using it as a landing strip. Cobra invaded and all hell broke loose. Check this out along with my other pages... As always, I just post these to show to others, they are not for sale. Are you going to be the regular artist on G.I Joe? I like your more detailed style. Here are my Joe original art pieces. Issue #25 and #27. Both have a ton of characters and are in great condition. I’m going to do more issues of Gi Joe. But can’t say too much. They are rotating artists on each arc. But seems to be enjoying my work, as long as I’m going to do my 10th issue of Joes.